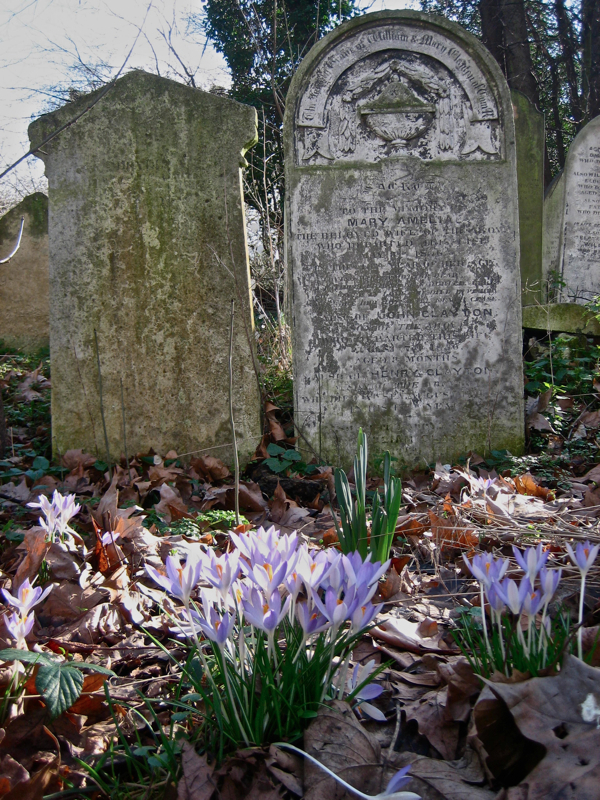 When yesterday’s unseasonably warm sunshine brought temperatures of ten degrees to the East End and the promise of an early Spring, I decided to return to Bow Cemetery – where I spent one of the happiest days of last Summer - to see if the bulbs were showing yet. 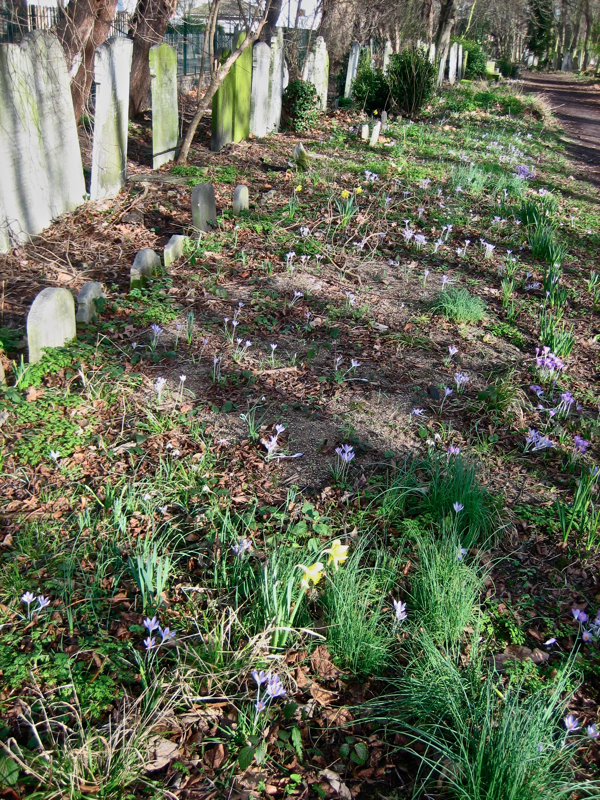 Already I have some Snowdrops, Hellebores and a few Primroses in flower in my Spitalfields garden, but at Bow I was welcomed by thousands of Crocuses of every colour and variety spangling the graveyard with their gleaming flowers. 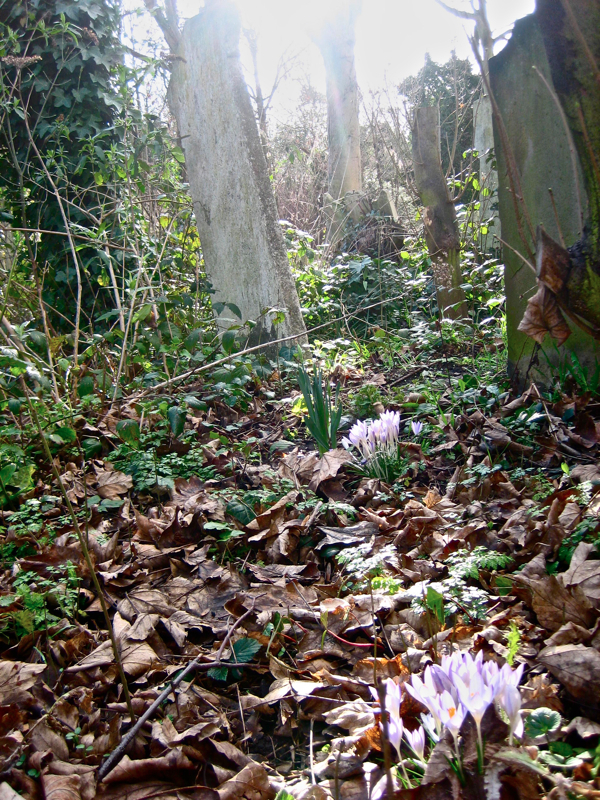 Beaten and bowed, grey-faced and sneezing, coughing and shivering, the harsh Winter has taken it out of me, but feeling the warmth of the sun today and seeing these sprouting bulbs in such profusion restored my hope that benign weather will come before too long. 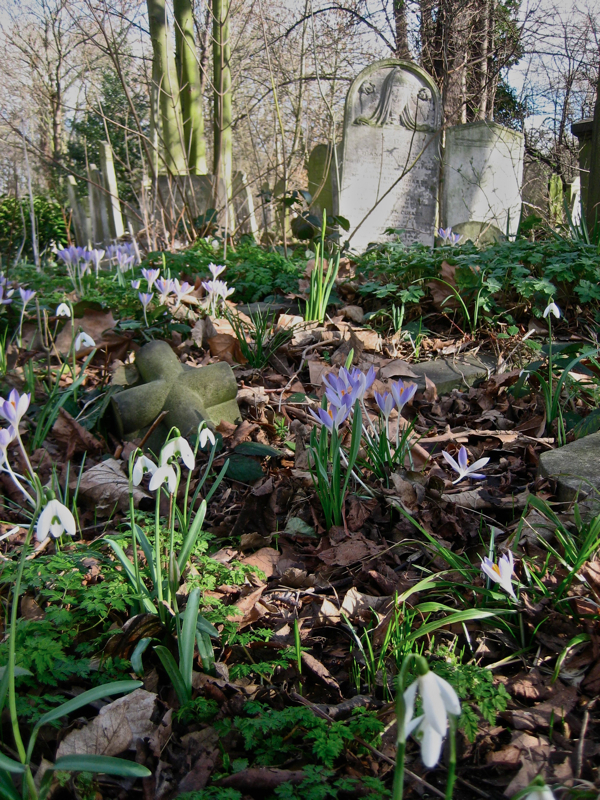 Some of my earliest crayon drawings are of snowdrops, and the annual miracle of Spring bulbs erupting out of the barren earth never ceases to touch my heart – an emotionalism amplified in a cemetery to see life spring abundant and graceful in the landscape of death. 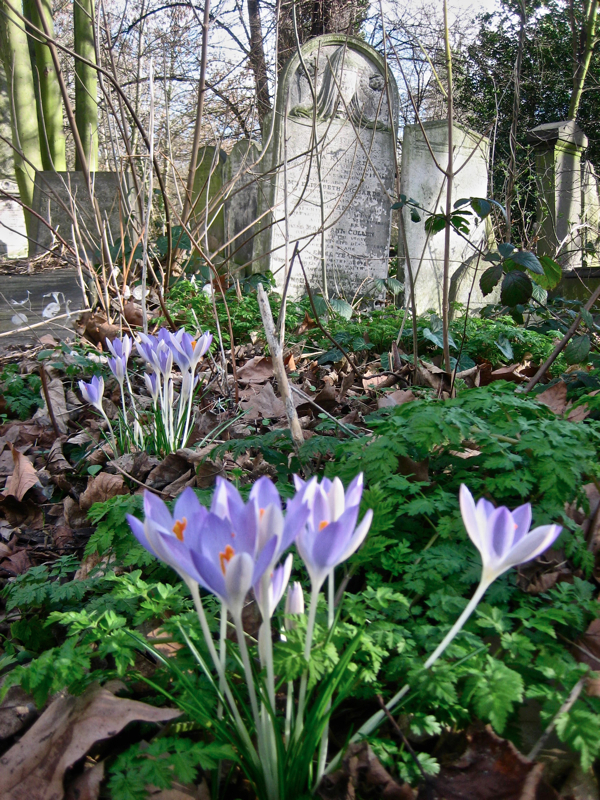 The numberless dead of East London – the poor buried for the most part in unmarked communal graves – are coming back to us as perfect tiny flowers of white, purple and yellow, and the sober background of grey tombs and stones serves to emphasis the curious delicate life of these vibrant blooms, glowing in the sunshine. 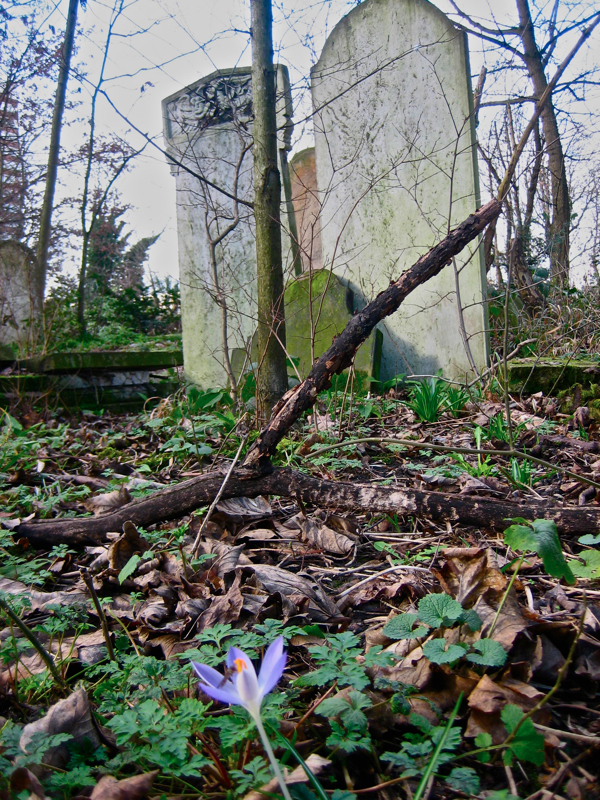 Here within the shelter of the old walls, the Spring bulbs are further ahead than elsewhere the East End and I arrived at Bow Cemetery just as the Snowdrops were coming to an end, the Crocuses were in full flower and the Daffodils were beginning. 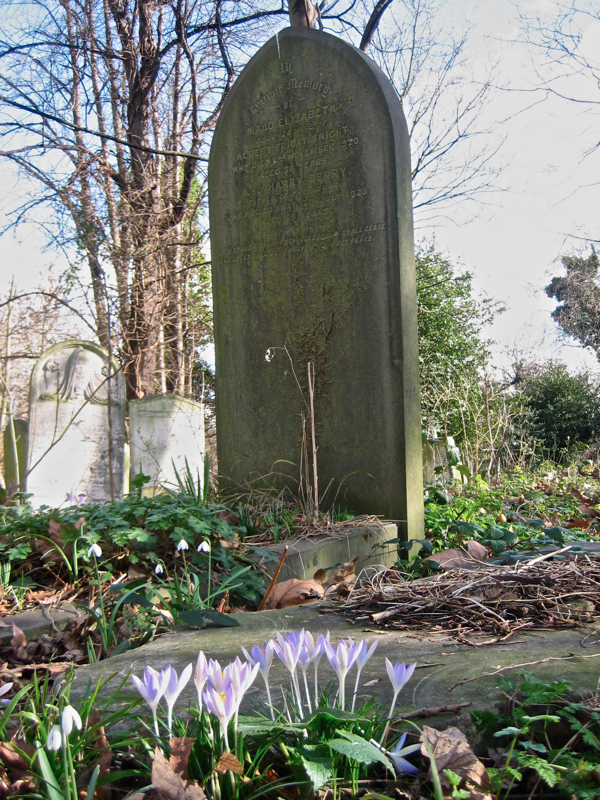 Thus a sequence of flowers is set in motion, with bulbs continuing through until April when the Bluebells will come leading us through to the acceleration of Summer growth, blanketing the cemetery in lush foliage again. As before, I found myself alone in the vast cemetery save a few Magpies, Crows and some errant Squirrels, chasing each other around. 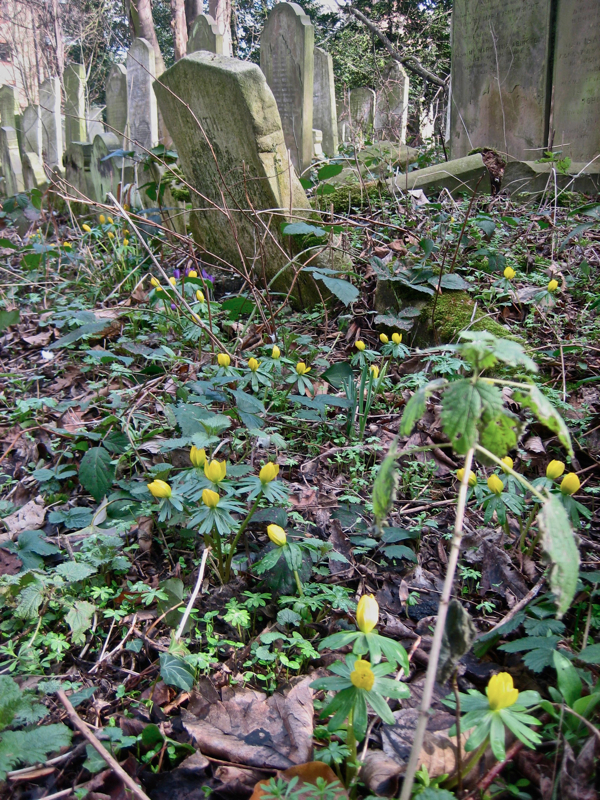 Walking further into the woodland, I found yellow Winter Aconites gleaming bright against the grey tombstones and, crouching down, I discovered wild Violets in flower too. Beneath an intense blue sky, to the chorus of birdsong echoing among the trees, Spring was making a persuasive showing. 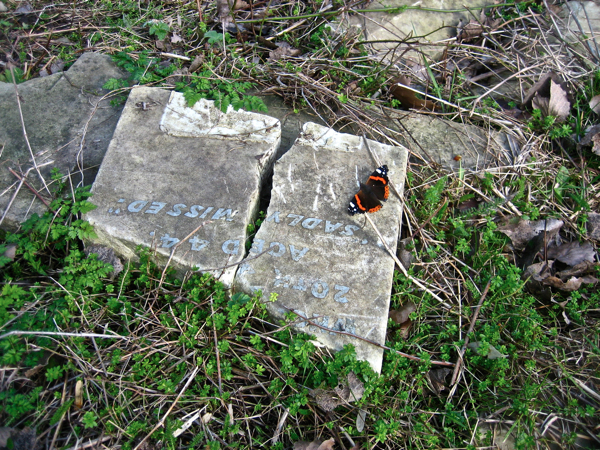 Stepping into a clearing, I came upon a Red Admiral butterfly basking upon a broken tombstone, as if to draw my attention to the text upon it, “Sadly Missed,” commenting upon this precious day of sunshine. Butterflies are rare in the city in any season, but to see a Red Admiral, which is a sight of high Summer, in February is extraordinary. My first assumption was that I was witnessing the single day in the tenuous life of this vulnerable creature, but in fact the hardy Red Admiral is one of the last to be seen before the onset of frost and can emerge from months of hibernation to enjoy single days of sunlight. Such is the solemn poetry of a lone butterfly in Winter. It may be over a month yet before it is officially Spring, but we are at the beginning now, and I offer you my pictures as evidence, should you require inducement to believe it. The Spring bulbs are awakening from their Winter sleep. Daffodils will be in flower next week. 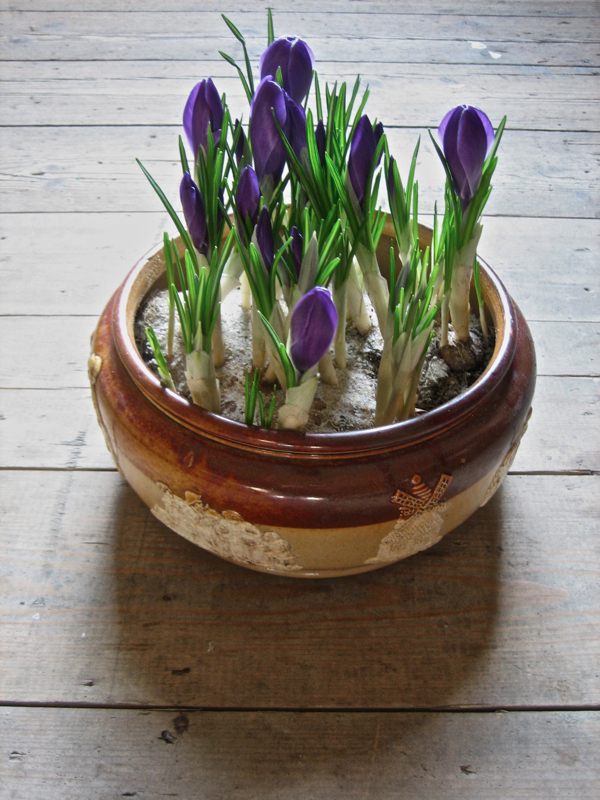 My Crocuses from Columbia Rd Market in a Doulton Lambeth bowl. So moving. 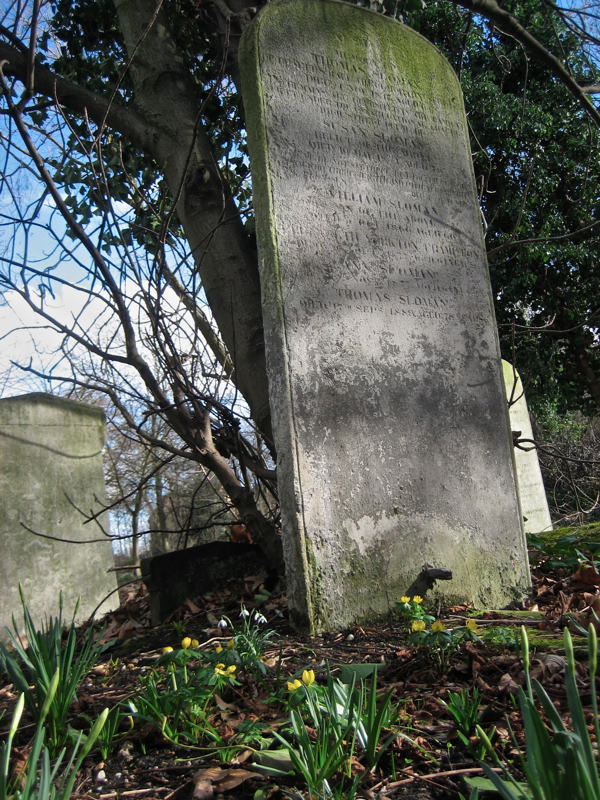 There is a legend here that a homesick sailor was buried with English seeds in his pocket, and the flowers later pushed up through the Australian soil. In western New York State in the 40′s, my grandmother took me along to tidy up one of our family cemeteries, and I still think they are one of the best places to see flora and fauna! There is a lovely one on Fulham Palace Road which I visit when in London, where my own grandaughter and I saw jays, foxes, squirrels, butterflies etc. They are lungs in a very polluted area. How encouraging to see little signs of new life. Some of your best ever photographs here Gentle Author. Wonderfully evocative. Thankyou. Oh, spring! I forget every year what it’s like, beautiful! 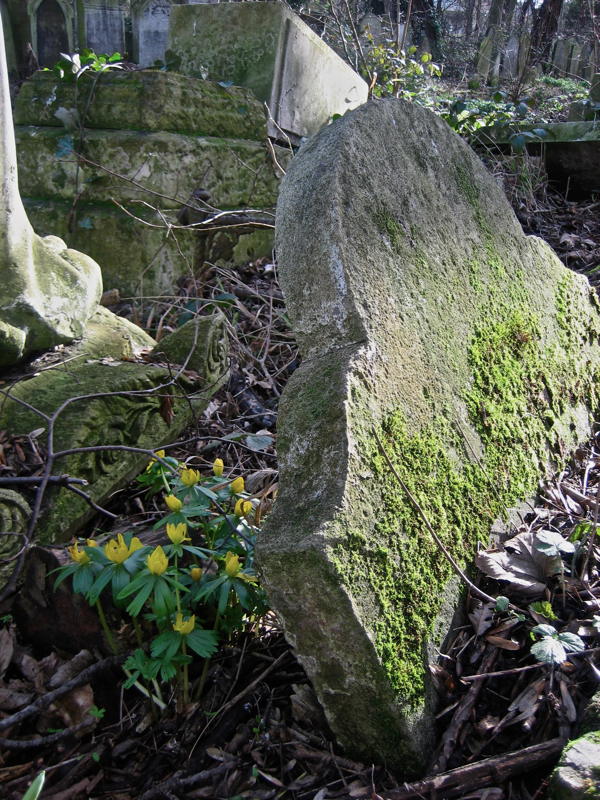 I love graveyards at any time of year, so peaceful usually! Beautiful pictures! 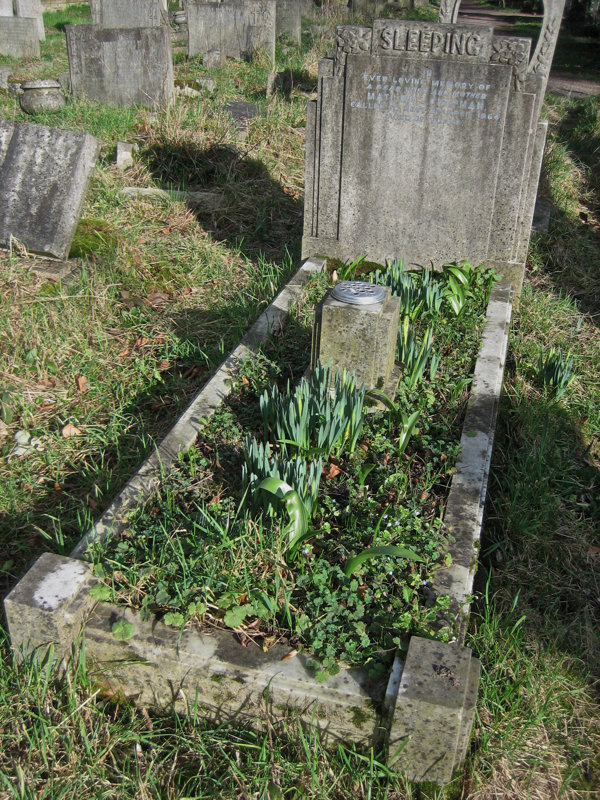 Have the inscriptions on the gravestones been transcribed? 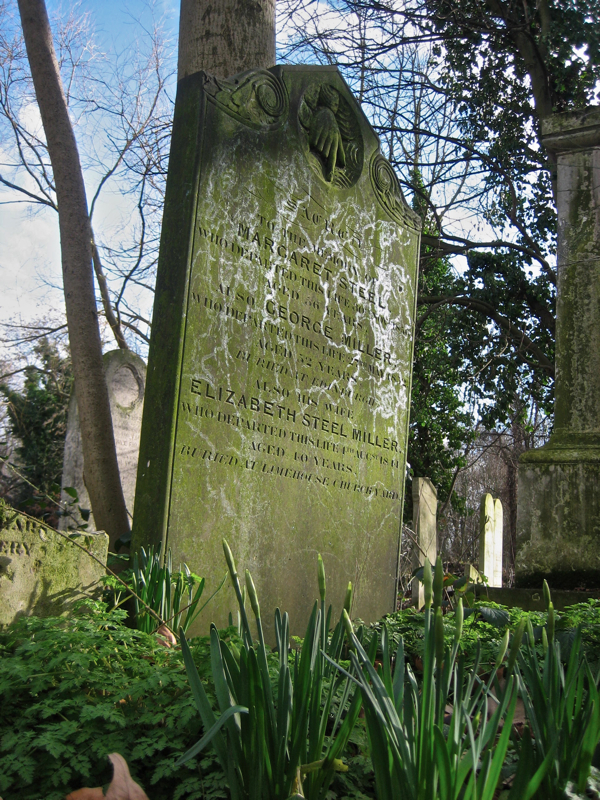 Descendants would love to know of ancestors buried here! to see if the bulbs were showing yet around you. 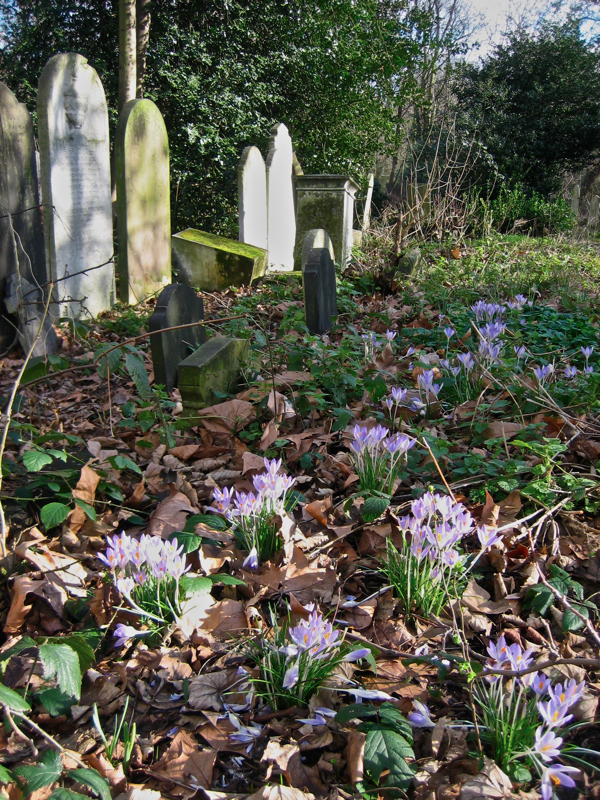 And at Bow I was welcomed by the silent song of thousands of Crocuses of every colour and variety spangling, spacing sprucing the graveyard . 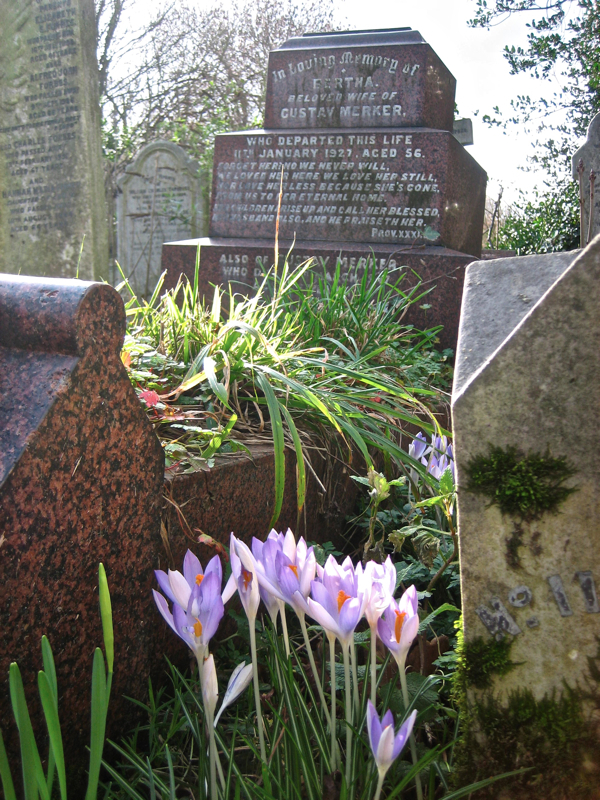 And you lived on with these gleaming flowers. You in those last days , beaten and bowed, grey-faced and sneezing, coughing and shivering, the harsh Winter had taken it out of me,you wished for nothingness and believed it too. and the warmth of the sun today I saw you again. My eyes seeing these sprouting bulbs , a profusion of life. So serene. 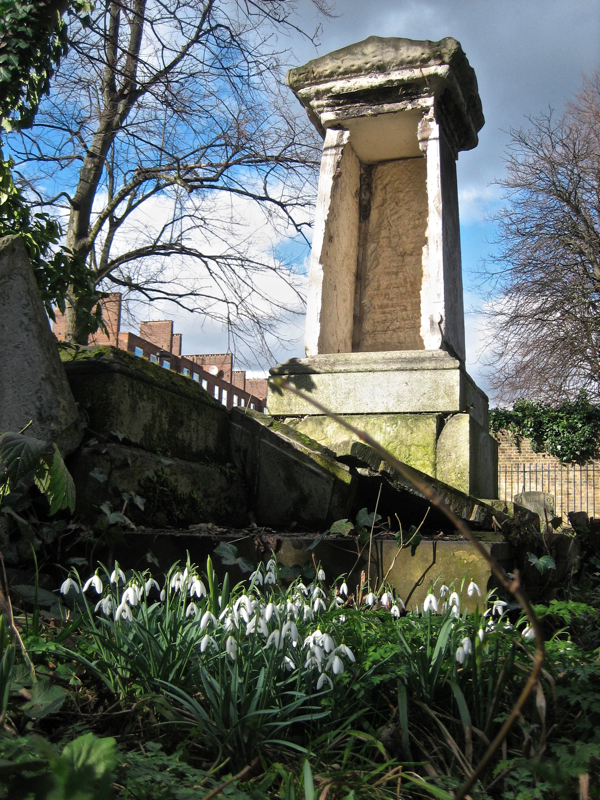 So peaceful, I last walked through here on a visit home in 2002, a short cut to Mile End Station from Spanby Road. Nature weaving her magic and allowed to do so at will. How very precious as are your splendid photographs. Thank you very much. 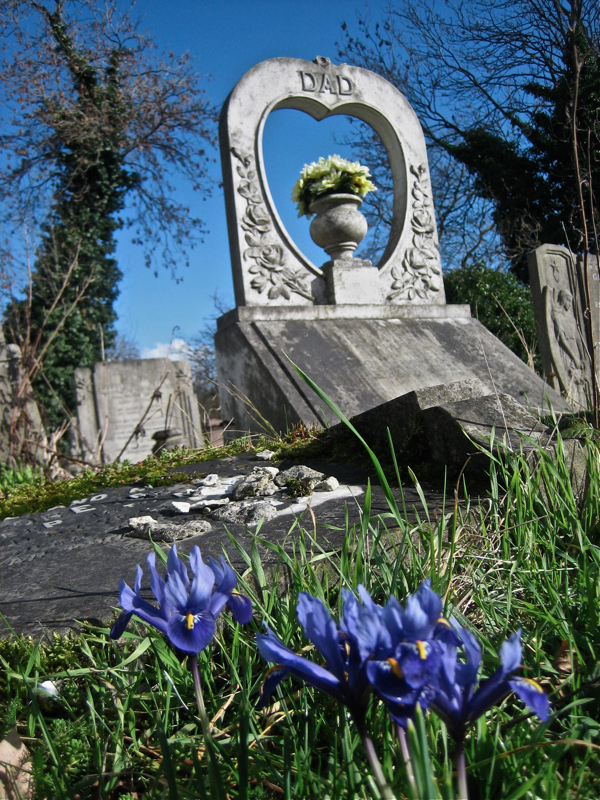 how comforting and delightful to see,that although they probably have no more relations alive around to bring them flowers ,nature is looking after his own just the same …..ashes to ashes. Thank you for pointing us to this post today – I think I missed it when you originally posted it. Beautiful photos of a very atmospheric place. 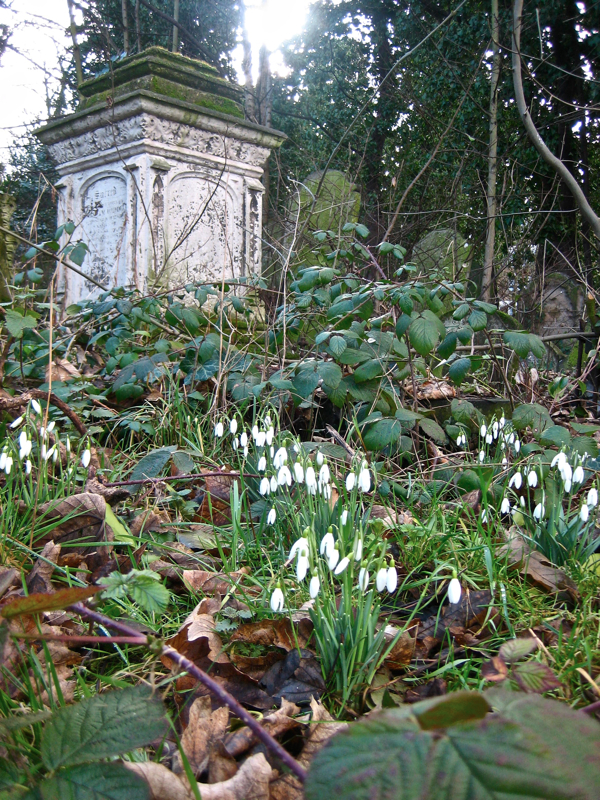 I love the juxtaposition of the snowdrops with the graves and the trailing ivy.